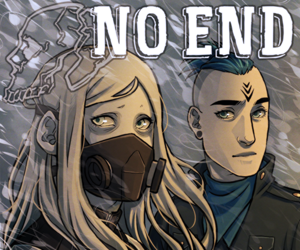 No End is a webcomic about a group of people struggling to survive in a post apocalyptic country ravaged by an unyielding winter and hordes of undead. Living amid a world of horror doesn’t erase the cast’s day-to-day worries about identity, family, friendship and betrayal, as they seek people they can trust, as well a legendary place called “Haven” rumored to be free of the cold and horror. Just as none of them are sure that it even exists, they aren’t sure what their place in their world is. But each step forward leads towards who they are, who they should become, and where they belong. Due to it’s initial inspiration from an RP shared by the creators, No End has always strongly focused on its characters - their growth, their motivations, and the bonds woven between them. The post-apocalyptic setting is used to add suspense, and to put emphasis on the character’s internal struggles. This webcomic also features LGBTQA+ themes and characters – all the characters in the main cast are queer.